A hot spot is a superficial skin infection that results when the normal skin bacteria overrun the skin’s defense’s, as a result of damage to the skin surface. This is most often started by the dog chewing or scratching at the site. In the first stages of the formation of a hot spot, the skin becomes moist, inflamed (red), pruritic (itchy), and infected. Pus oozes from the damaged skin as bacterial infection sets in. 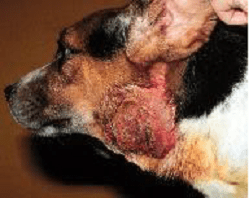 The dried pus and damaged skin surface from the infection will form the tightly-adhered crust, and the dog will lose hair over the infection site. Frequently, dogs show pain when the site is touched at this stage. humid weather, but can occur year-round, depending on the inciting cause. the best antibiotic to use during the treatment phase. prevent your pet from bothering the infected area. the animal is in, how long the problem has been going on, and if the problem is a recurring one.